John McNamara – Coaching for Confidence » MIND THE (confidence) GAP! There is a cohort of people sitting on the edge of their chair, patiently waiting for the day they feel confident before they finally take some action. When this day arrives they will ask their boss for a pay rise, voice their opinion in meetings, pick up the phone and call every customer in their pipeline, ask that cute girl in the cafe out for a drink, or simply walk from this job that is bringing them nothing but migraines and back pains. There is a world full of opportunity out there for those willing to bridge the gap between, the edge of their chair and their confident self. The confidence gap is the space between where you are at right now and how confident you believe you need to feel before you can pursue a goal, or something of interest. In this gap sits an abundance of opportunity, fulfilment and money. There is two layers to the confidence required to fill this gap however and this is where many people fall short. The first is surface level confidence, or in this instance, competence. The second is core confidence, or self-esteem. Competence by definition, is your ability to do something successfully or efficiently. Esteem comes from the Latin word aestimare, meaning to put a value on. Hence self-esteem translates to the value you put on yourself. The implications of both of these are huge in the workplace and life in general really. Seen as the “Let’s Make Linkedin Great Again” police might castigate me if I speak about life in general, I will focus on matters of business solely in this article. 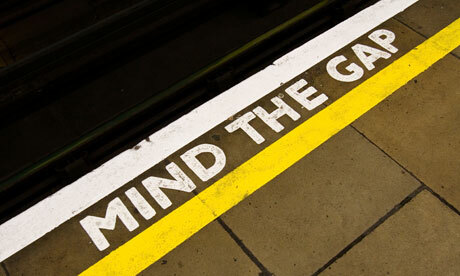 So back to minding the gap and what lies in there. First and foremost we need to decipher whether our challenge is on the surface, or at the core. Robert Dilts phenomenal work on Logical Levels states that change must occur at the level at which it is happening. There are 6 levels in his work, which I’d recommend everyone read btw. For those looking at making change at the level of competency, then they would firstly need to focus on Level 2, which is their behaviour. This looks at what the actions you do, or don’t, take. You would also definitely need to focus on Level 3, which is your capabilities. These are the knowledge, skills and processes required to make a positive impact in this area. If a person is new to a role, or has just been promoted, they can rapidly increase their confidence by focusing on Levels 2 and 3. Grab yourself a mentor, voraciously read everything you can about your role and industry, ask lots of questions and you will see a rapid boost in your competency levels. This will in turn see a significant increase in your surface level confidence in the role. Yeah yeah I know what you are going to ask next. But what if I do all of that and I still don’t feel good enough, or confident enough? I am afraid of being “found out.” Constantly thinking “I really shouldn’t be here” or “Everyone else looks so confident and calm in here and I’m shi**ing myself in every meeting and call.” In 95% of the people I have met and worked with over the past numbers of years I know one thing for certain. Their lack of confidence in their roles had nothing whatsoever got to do with their ability to carry out the job they were hired to do. Competency. This was solely down to the value they put on themselves. Self-esteem. If you continuously doubts yourself and feed your mind with self defeating thoughts then no amount of BA’s, MA’s or MDMA is going to make you become truly confident in your SELF. This is where the focus needs to shift to working on Level 4 and 5. Level 4 focuses on beliefs and values (WHY?) Whether we view things as possible, or impossible. The things we value personally and the belief we have around our own capabilities to manage in a given situation. These shape every decision we make and the altitude we will reach. Having a deep understanding of your values and beliefs plays a huge part in Level 5 also, which is Identity (Who.) This is who we really are. To develop competency you need to learn as much as you can about the new area, or skill. Hence, when you are trying to develop confidence in your self, you need to learn as much as you possibly can about who YOU are. What your values are, how you view yourself, where your strengths lie, when are you most effective, how do you sabotage yourself and on and on it goes. Some proper self-reflection, or a quality coach, will open this up in no time. Once you’ve opened the Pandora’s box, you have three things you MUST do. Play hard in your areas of strength, go to work on the areas you can improve and accept the ones you can’t, immediately. These 3 steps will change everything. Forever. I would spend a little bit of time trying to identify at which level change needs to occur for you to bridge the gap. If you do, then it will open up a world of possibility in your professional life. If you are finding this a challenge, drop me a line as this is an area I am coaching clients all over the world in.